Please excuse this picture. It doesn't look very appetizing, but it tastes absolutely delicious!! We love risotto. We have tried to make it before and the first time it was terrible. But then, the more I tried, the better it got. I think that my favorite combination is sun dried tomatoes with goat cheese. I had half of a container of Mascarpone Cheese in the fridge from our Roasted Tomato & Gorgonzola Sauce I made so I thought I'd use it up in here so I didn't end up wasting it! This is my own recipe, I don't have exact measurements of all of the ingredients that I used. You may need to adjust the amount of liquid you use. Lightly toast the arborio rice, being careful not to burn it. Then, slowly add broth, about a cup at a time, until it has been absorbed--stirring often. Add the chopped garlic and more broth. Continue to add the broth and stir until the rice has become tender. It takes a little while, but it is worth it, I promise!! 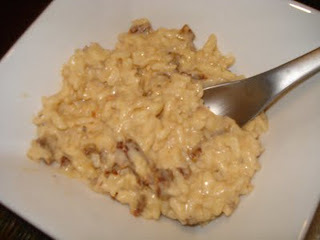 Once there is enough broth in the risotto, add the cheeses and the tomatoes, stirring well to combine everything. Serve immediately.